Winter in Berkeley. The trees lining Sproul Plaza are sparse, their bare limbs spreading out over the throngs of students and faculty members below, their fallen leaves lining the campus floor in a diverse array of color and texture reflective of the chaotic bustle. Winter on Sproul is filled with students and members of the Berkeley community spouting political and religious beliefs, handing out flyers and pamphlets to stressed out students. For those accustomed to UC Berkeley, this isn’t an unfamiliar sight. But it also once served as a backdrop for one of the most important student movements in history. On Dec. 2 of 1964, Mario Savio ascended the steps of Sproul Hall — now appropriately named the Savio Steps — and gave his famous speech calling out the “operation of the machine,” a cataclysmic gem of the Berkeley Free Speech Movement. Almost exactly 50 years later, on Dec. 9, 2014, protesters again captured Berkeley’s attention in the fourth night of the Black Lives Matter protests. In 1964, almost 800 students were arrested for their public participation, but in 2014, there were rounds of tear gas thrown into the crowds. We are no stranger to conflict at the culmination of civil unrest. The Berkeley community and campus have created a symbol out of Mario Savio’s charismatic and eloquent speech that day. His bravery, in the face of a university system attempting to intimidate and silence him, has transformed to represent the freedom of speech we UC Berkeley students practice everyday. Activism is cemented into the foundation of those steps and defines the core of what it means to be a student at this campus. Be that as it may, to what extent do we accept the freedom to express when it begins harming the dialogue surrounding social reforms we’ve worked so hard to attain? 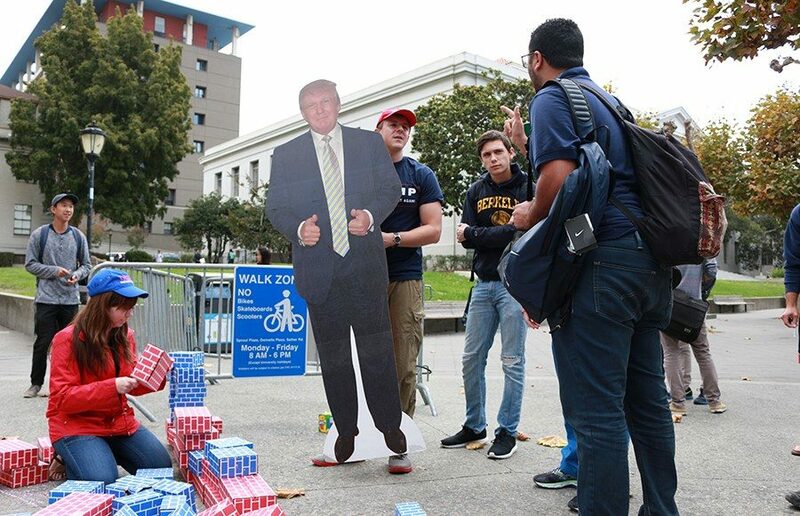 Recently, there has been debate over this process in regards to demonstrations on Sproul in support of presidential candidate Donald Trump. In no way can one deny that the rhetoric Trump expresses is hateful and non-inclusive in its most basic forms. Civilians not affiliated with the school demonstrated this message when on Sept. 12 they built a mock border wall in front of Sather Gate, their act a deplorable mark against the undocumented student community. “I think as a society which seeks to progress, we need to be mindful when freedom of speech comes at the expense of others’ lives. Therein do issues arise, when the lack of critical thought is placed into what someone expresses freely, you get conflict that often comes at the expense of marginalized communities,” said UC Berkeley fourth-year transfer student and member of Rising Immigrant Scholars Through Education, or RISE, Juan Prieto in an email. “As stated before, to me, freedom of speech means you can say what you want and when you want without the government coming down on you to silence it. Do Republicans have the right to wear Trump hats and shirts? Or have a cutout of the man? Of course they do. But freedom of speech also protects our right to criticize them and openly challenge their assumptions,” he said. The Berkeley College Republicans, or BCR, student group was lambasted for the mock wall demonstration, as many wrongfully attributed these events as a club-sponsored activity. Even before this, there have been multiple reported attacks and cases of vandalism against this club’s expression of their political preferences for Donald Trump. In today’s tense political discourse, neither side of the aisle is winning. The idea of protective speech hangs on the edge of partisan ideals, the injustices toward minority groups and a perceived protection of what is largely deemed as the politically correct. There is no doubt that a foundational consequence of the right to express oneself is that there will be dissenting opinions in response; this is what provides the discourse and the liberty that this nation holds dearly. At what point, though, does this discussion harm the very foundation it works to support? Our role as the home of the Free Speech Movement puts the use of this freedom under intense scrutiny. Each of us works to enact those freedoms in order to benefit ourselves, as we fight for the causes we support. But if our highest aim is to protect our opinions at the cost of lowering the opposition, we lose ourselves in empty rhetoric. “We’ve finally gotten into a position where we have to consider being responsible, because now we have the freedom within which to be responsible,” said Mario Savio following the success of Berkeley’s Free Speech Movement. Our legacy as UC Berkeley students is to carry on this emblem of the movement, our responsibility to enact the freedoms that students before us fought to protect. The conservative versus liberal clash has always existed in the microcosm of Berkeley, reflecting the larger division in this nation. Republican Ronald Reagan was largely able to guarantee his successful election as California governor by promising to quell the future uprising of liberal student activism. We’ve achieved our right to speech, and yet violence and contentious action continue to permeate our public discourse. This only adds to the cycle of victimhood, as each dissenting party is at the end of what appears to them as an attack. After the Trump demonstrations on Sproul, undocumented students on campus who participated in the counterprotest have claimed to have received threats calling to have them and their families deported. “I practice my freedom of speech at Berkeley every time I fight for my existence here as an undocumented immigrant. Unfortunately, that often comes at the price of being the target to hate speech and threats of me or my family being reported to ICE,” said Prieto, mirroring these sentiments. The BCR has also marked itself as a victim of threats. “On one hand, administration will take down flyers that are deemed offensive, and on the other hand, administration turns a blind eye to repeated, targeted attacks on a particular group,” said Chiara. “The absolute hypocrisy of condemnation of free expression at the very home of the Free Speech Movement is frightening. It is clear that these recent events have incited bias toward each group, a fact that will remain constant in political and social discourse as a sheer product of human interaction. This is something that we as Berkeley students cannot control. We can, however, take control over the conversation. That there is a hypocrisy in free expression on our campus, that is clear. U.S. President Barack Obama alluded to this issue in a comment regarding the politically correct. “I don’t agree that you, when you become students at colleges, have to be coddled and protected from different points of view. I think you should be able to — anybody who comes to speak to you and you disagree with — you should have an argument with them,” said Obama during a town hall on education issues in Iowa last year. In order to sustain this freedom and the productive discourse that follows, we should be able to participate with each other in a reflective manner that presents our perspectives and views, regardless of political and social status. But this can prove difficult in a climate where a presidential nominee creates a dialogue that purportedly incites division and action based on prejudice. Freedom of speech is not freedom to incite hate or danger. Divisive rhetoric by a divisive candidate only contributes to this cycle of misunderstanding. Regardless of our access to speech, we need to also acknowledge how we are using it and which ideologies we are promoting. A fair response in public discourse is not an attack, it’s an exacting practice of the ideals we fight for every day. Our rights to expression do not absolve the responsibility that we as Berkeley students hold in our legacy as heirs to the movements of social justice. Think, reflect, act. Act peacefully and in just cause. Respect the communities your language is directed toward and carefully disseminate the information you receive. Let us once again serve as a representation for this country. We as a student body are better than the violent Trump rallies and are better than aggressive street protests. How do we, in this day and age, in the never-ending conservative versus liberal media agenda fight to reclaim our story? Unfortunately, I don’t have the answer, and I don’t think anyone has the one solution. I do know, however, that we are privileged to have access to the No. 1 public school education in the country. An education that, because of the Free Speech Movement, intersects academia with social justice at every possible turn. The students before us fought for our freedom of speech, so let’s use it to create productive discourses that will aid us as the next generation of UC Berkeley students who strive for social reformation. Let’s take the story back.